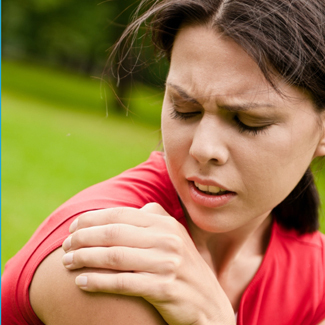 Shoulder pain is a common problem treated by osteopaths. It is often caused by spending long periods of time sitting at desks, typing on the computer, or watching the television, as these activities all place strain on your shoulders, especially if you have bad posture (hunching). Rotator cuff strains and tears – the rotator cuff is a group of muscles in the shoulder that give it most of its stability. These can be strained or torn at work or in sport, which can lead to pain and weakness in the shoulder. The most common rotator cuff muscle to be involved in injury is supraspinatus. Osteopathic treatments for the shoulder involve looking at the whole shoulder region which involves the neck, mid back and shoulder blade. By mobilising the shoulder, gently stretching the joint capsule, and prescribing the correct rehabilitative exercises, osteopathy can be very beneficial to most shoulder injuries. Shoulder injury that isn’t healing naturally? Call us today and see if we can help on 01707 655514. Or book a free 15 minute consultation and let us have a look.